The most crucial difference between the active and passive transducer is that the active transducer does not use any external power source for producing the output, whereas the passive transducer requires the additional energy source for working. The other differences between active and passive transducer are explained below in the comparison chart. The physical forces like pressure, humidity, displacement etc. are difficult to measure. For measuring the physical quantities, the device is required, which converts the physical quantities into easy measurable energy. The conversion of physical forces or non-measurable energy into measurable energy can be done with the help of the transducer. What is The transducer which generate the output in the form of voltage or current, without any external energy source is known as active transducer. The passive transducer means the transducer whose internal parameters like capacitance, resistance & inductance changes because of the input signal. Working Principle Draw energy from the measurand source. Take power from the external source which changes the physical properties of transducer. Output signal Produces from the signal to be measured. Output obtains by receiving the signal from the external power source. Examples Tachogenerator, Thermocouple, Photovoltaic cell etc. Thermistor, Differential transformer, Photomultiplier tube, Photovoltaic cell. The transducer whose output is obtained in the form of voltage or current without any additional auxiliary source is known as the active transducer. It works on the principle of conversion of energy from one form to another. The active transducer is also known as the self-generating transducer because they self-develop their electrical output signal. The energy requires for generating the output signals are obtained from the physical quantity which is to be measured. Example: The Piezo electrical crystal is the example of the natural active transducer. The crystal has the property of producing the output voltage when the external force applied to them. The piezoelectric crystal is placed between the two metallic electrodes. When the force applied to the crystal, the voltage induces across it. In passive transducer, the output is obtained by changing the physical properties (resistance, inductance, and capacitance) of the material. In other words, the passive transducer takes power from the external energy source for transduction. The word transduction means conversion of energy from one form to another. 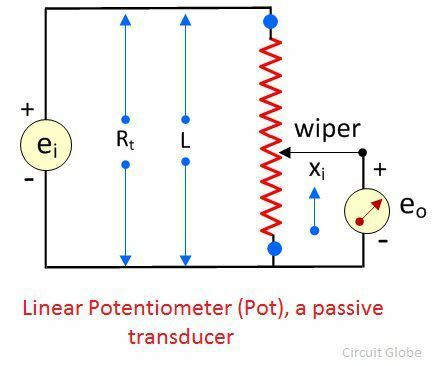 Example: The linear potentiometer is the examples of the passive transducer. It is used for measuring the displacement. The POT requires the external power source ei for work. It measures the linear displacement xi. Consider the L is the length of the potentiometer. Ri is their total internal resistance and xi is their input displacement. The output voltage is calculated by the formula shown below. The transducer which gives the electrical output (in the form of voltage and current) without any external energy source is known as the active transducer. 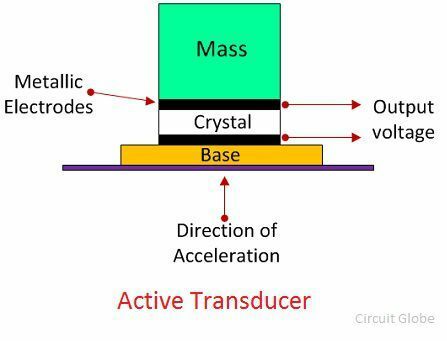 The transducer whose physical properties varies because of the input or measurand signal is known as the passive transducer. The active transducer does not require any additional source while the passive transducer requires the additional energy source. Active transducer draws energy from the measurand source and gives the electrical output while in passive transducer the transduction can be done by changing the physical property of the material. The design of active transducer is simple as compared to the passive transducer. The resolution of an active transducer is low while that of the passive transducer is high. Note: The term resolution means the variation occurs in the input of the transducer causes the change in their output. The active transducer produces the output signal of very low amplitude. Thus, their output signal needs to be amplified. Whereas, the amplification is not required in the output signal of the passive transducer. In the active transducer, the output electrical signal is obtained from the measurand signal. Whereas in passive transducer the output signal is obtained by taking power from the external energy source. The active and passive transducer both converts the physical forces into easy measurable energy. The active transducer converts the energy without taking the auxiliary energy supply. And in the passive transducer, the external power source is required for energy conversion.